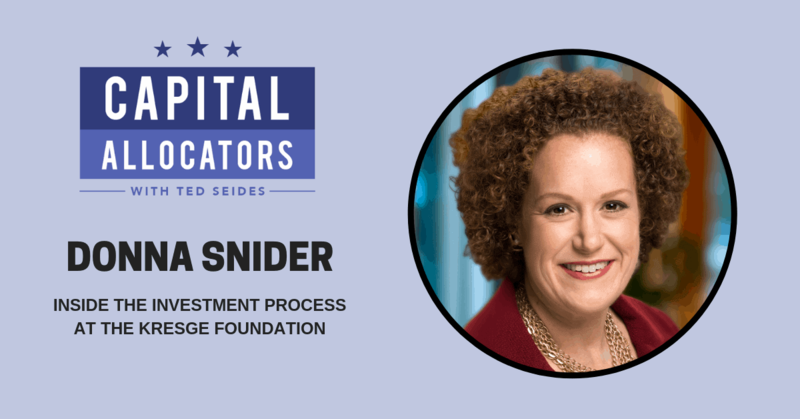 Donna Snider is a Managing Director at the $4 billion Kresge Foundation, where she has worked for ten years as one of three senior team members under Chief Investment Officer Rob Manilla. Last summer, Institutional Investor named Donna the number one ranked Most Wanted CIO of the future. Our conversation starts with Donna sharing the cross fertilization of bringing her sell side trading experience to a Foundation and on the flip side learning manager selection from her very first data point. We then turn to the inner workings of the Foundation investment program from the perspective of a long-tenured senior team member, including the nitty gritty details of the internal investment process, the tricky decision process that goes into adding a manager or taking one out of the portfolio, the management of overlays and internal trades, the different roles of a CIO and senior investment team member, current challenges in venture capital, value investing, hedge funds, and emerging markets, and the politics of getting named a Most Wanted future CIO.